This book is principally a Microsoft Project book aimed at Project Management Professionals who understand the PMBOK Guide Fifth Edition processes and wish to learn how to use Microsoft Office Project 2013 or 2016 to plan and control their projects in a PMBK® Guide environment and discover how to gain the most from the software. The book is designed for users Microsoft Project 2013 or 2016 to upgrade their skills and for new planners to learn the software. It starts with the basics required to create a schedule, through resource planning and on to more advanced features. There is also a new chapter which introduces the Microsoft Project Server functions. 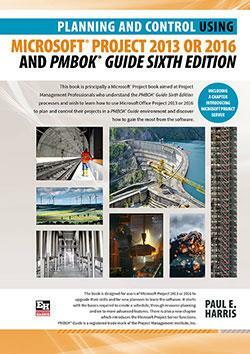 A Microsoft Project user guide and training manual written for Project Management Professionals following the PMBOK Guide Sixth Edition who wish to learn how to schedule projects in a single project environment with or without Resources with Microsoft Project. The book is packed with screen shots, constructive tips and is suitable as a training course handout, for learning the software or as a reference book. The book contains workshops with solutions at the end of each chapter for the reader to practice the skills taught in the chapter. Microsoft Project 2010 is an extensive software update with many new functions and as a result this is a complete rewrite of the author’s previous book. Explaining which PMBOK Guide processes the software will support and which it will not support. Concentrating on the core functions required to plan a project. Presents workable solutions to real day to day planning and scheduling problems and contains practical advice on how to set up the software. Explains some of the important differences between Microsoft Project and other scheduling software. Explains some of the more difficult calculations often omitted in other books. Includes exercises to reinforce the learning outcomes, a large number of screen dumps, numerous tips, a detailed index and command list at the start of each chapter as a quick reference. It has a new chapter introducing Microsoft Project Server.